more details to come, but please plan on coming. 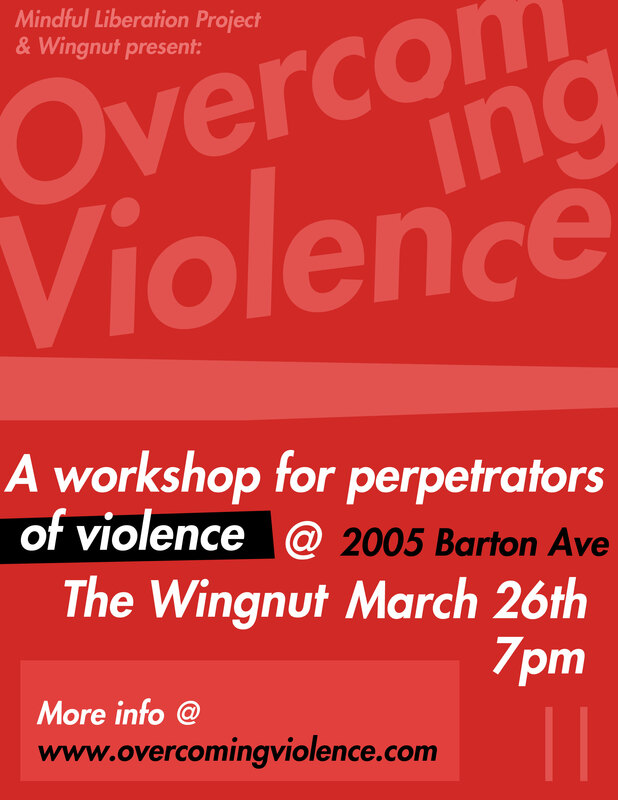 This workshop will focus on overcoming many types of violence, with a particular focus on domestic, sexual, and social violence, from the side of the perpetrator. The workshop will go over the cycle that leads a person to adopt and rationalize violent behaviour, and how a perpetrator can take steps to break this cycle. Running time will be around 2 hours. Due to the nature of the talk and intended audience, this is not guarunteed to be a Safe Space for Survivors of Violence. Richmond Food Not Bombs cooks from 12:30 to 3:45 every Sunday at the Wingnut Anarchist Collective at 2005 Barton Avenue. Often there is some downtime during the meal preparation and cooking time. To take advantage of that time to do more politically with Food Not Bombs we are trying the following idea. The Wingnut will now be providing the info and address of one political prisoner each week, who has a birthday that month, that folks can write a short note or a few words of encouragement to, which we will then mail out. We know that a lot of folks are not used to writing full letters, and we hope that through collaborating to fill paper with notes and drawings we can bring some cheer and solidarity to folks from various radical social movements (like ours) who are incarcerated. Richmond Food Not Bombs member and friend Mark Strandquist is working on a project in Richmond. There are opportunities for participation from anyone in the community. 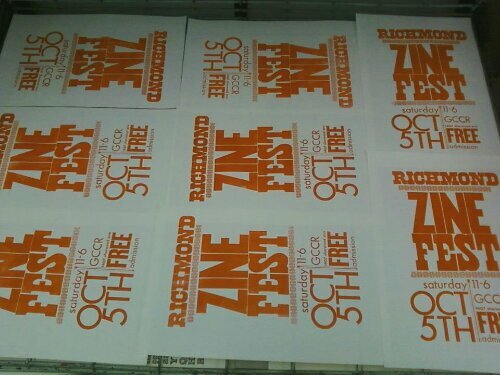 Mark will also bring this project to the 2013 Richmond Zine Fest as a display. From Mark’s website www.nomovement.com here is a description of the project. People’s Library is an ongoing collaborative project that incorporates interactive sculpture and community created ethnographies. The project features libraries designed, built and authored by community members. Utilizing donated books from individuals, public libraries, and thrift stores, the project transforms and re-purposes unwanted or otherwise discarded books into blank canvasses for oral histories, self-representation, and intimate reflection. People’s Library offers sustainable, collective and critical alternatives for the form and function of public space. The project is collaborative at every public stage of the project. While each book becomes a safe and personal space for intimate reflection, the books and installation are produced through collective and sustainable means. Each autonomous history becomes part of a larger whole. While in some instances, public spaces have utilized new media to invite patron participation, it is typically through internet based means. People’s Library champions collective production as an avenue for face to face interaction between diverse publics. The project reflects the histories, needs, desires of local residents, and re-interprets public institutions as a space for production, meditation, and alternative education. Begining in Spring, 2013, workshops will be held and the project will be built, managed and exhibited at the MLK Memorial Library in Washington, DC and included in the permanent collection of the Main Branch of the Richmond Public Library in Richmond, VA.
Papermaking: sourcing pages from the discarded books, participants will blend, pulp and dry materials to create new paper. Creative Content: participants will collectively formulate, choose and print the prompts to be included in each book. Bookbinding: the re-purposed paper will be rebound into the covers of the discarded books. The Bookshelf: participants will collectively design and construct the interactive sculpture that will house the books. Card Catalog: participants will design, construct and implement a system for the books to be checked out by the public. This system will include space for the reader to reflect and react to their chosen book, the project, and the over-all experience. 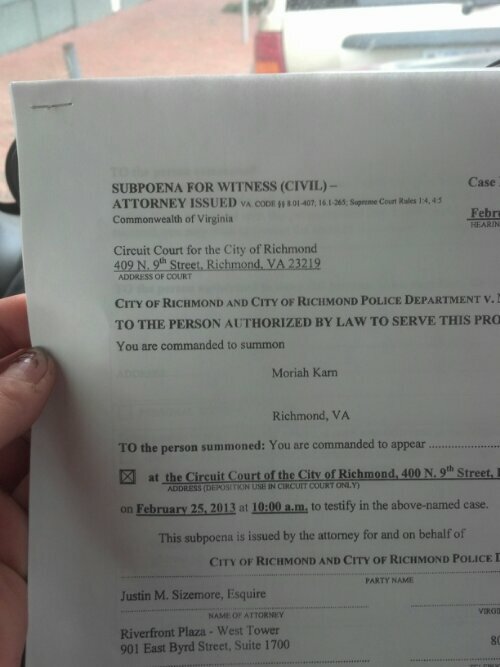 Mo Karn of the Wingnut has been subpoenaed, a few weeks ago, and is being forced to go to court on Monday Feb. 25th as a witness (against their will) in a civil case stemming from the RPD documents recently linked to from this website. Mo is not clear on what they are or are not allowed to talk about in regards to this matter, sorry for the lack of details. The numerous papers that have been served to Mo over the past few months have included various injunctions which make it incredibly difficult to determine where Mo’s right to free speech remains around these issues. 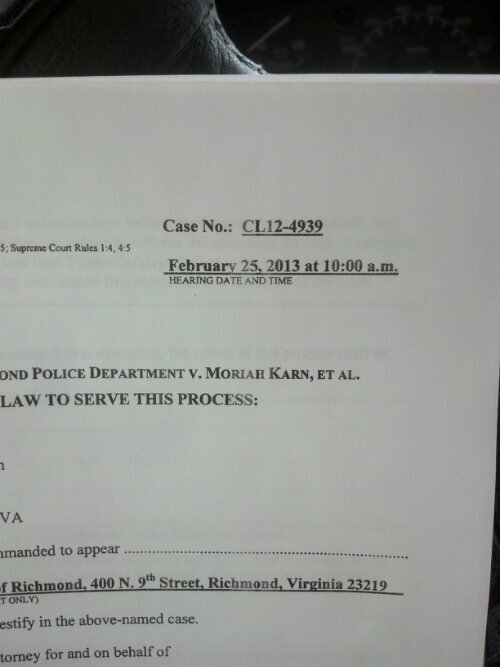 Earlier in this ordeal the cops had tried to force Mo to attend a deposition and answer many questions about things not even related to any RPD documents. This looks like it might be the same situation. Mo has legal representation, and will give an update whenever they get out of court. 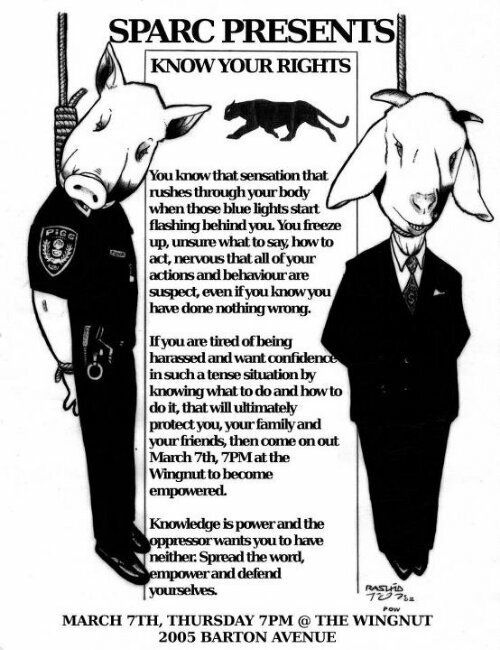 We will also be having a How To Copwatch Training on Thursday April 4th at 7pm, and we highly recommend that folks do the Know Your Rights Training as a prerequisite. Save the Date: March 30th Zine Making day! Come to the Wingnut on Saturday March 30th from 1pm to 6pm to hang out and work on zines! We will have collage materials, some art supplies and paper, hopefully our printer and copier up and running etc. Bring the projects you are working on and any supplies to share and/or snacks to share.